Each child is a full and complete individual in his or her own right; therefore, education must be personal and individual. Certain stages in a child’s development make the child receptive to different types of learning, and these stages must be built into the teaching system to be effective. Children are naturally eager and able to learn when provided with the appropriate tools, guidance, and prepared environment. The goal of early childhood education must be to stimulate and develop each child’s natural talents and innate desire to learn. In 1911, the Montessori philosophy was introduced to the U.S. Initially, it was dismissed as too progressive. In the early ‘60s, social change renewed interest in Dr. Montessori’s philosophy as an alternative form of education. Today it is accepted throughout the U.S.
Dr. Montessori concluded that children learn through their senses, progress most naturallyfrom the concrete to abstract, and learn best by using their hands to explore their world. Therefore, the Montessori method allows children to touch, see and hear the properties of an object or situation; and it uses a sequence of materials and individualized lessons to allow the child to progress from concrete materials to abstract expressions. Here’s an example: In the traditional teaching of numbers, one number is introduced at a time, usually through worksheets. Children are asked to name the number and then either circle it or circle the number of objects. 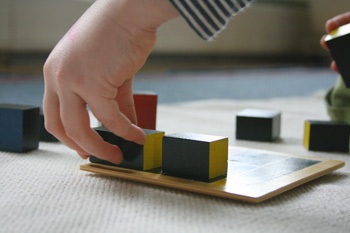 In contrast, the Montessori teacher begins with a concrete, perceptual experience. 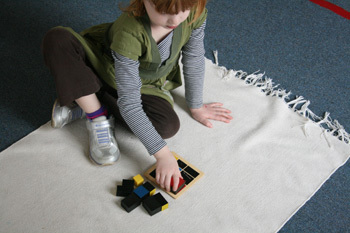 The child is presented with a sandpaper numeral card and traces the shape of the number while learning its name. The amount of the number becomes more meaningful when children are given a follow-up lesson with the spindle box, which allows them to concretely grasp each quantity and feel how it grows larger. This then is followed by numbers and counters where even / odd is visible. The child is thus involved in understanding numbers, quantity and one-to-one correspondence. This forms a sound, internalized basis for future math endeavors. Profound respect for each child is the basis for our curriculum. 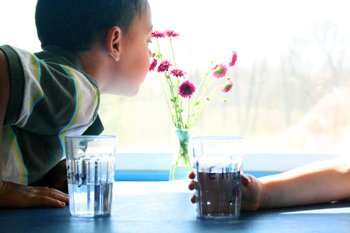 We focus on the development of each child’s potential at his or her own pace. Our Montessori teachers are specially trained to observe each child and design lessons based on his or her individual abilities and interests. Careful preparation by the teachers frees the children for self-directed learning, putting them in control of their environment and making it possible for them to pursue their individual interests and needs, as they relate to these six main areas of learning: practical life (everyday skills), sensorial (working with shapes, weights, textures), science & geography, math & language, art & music, and the prepared environment (working with the curriculum on display of their own accord and at their own pace). Our well-rounded curriculum also includes cooking, crafts, peace and diversity studies, outdoor education, Spanish with LanguageLive Academy™, Handwriting Without Tears™, and Zoophonics™. When you enter our school, you will immediately sense a difference. The classrooms are orderly, bright, child-sized and child-centered. Small-scale furniture and shelves are the rule with no adult furniture present. To appreciate how the children interact with the environment and each other you must see the class in “action,” so we invite parents of both prospective and enrolled students to plan a visit. At the beginning of each session, the children hang up their possessions on their own hook and change into indoor shoes. The children then go to a “work” of their own choosing and the work cycle begins. During the morning, we have a gathering where new material is introduced, with the teacher demonstrating when and how each item can be used and where it can be found in the classroom. Afterwards, the child may choose that activity or another — using it as fully as possible while also being encouraged to explore with it — and then return it to its own assigned place. If a child is hungry, there are always healthy snacks available. And if the weather is cooperating, we end the morning outside on the playground. On one day, there might be a music lesson; on another, a Spanish lesson. A special guest might visit to teach yoga or hand out free toothbrushes after a talk about dental care. In the fall, we might take a field trip to a pumpkin patch. If a special Parent’s Brunch is coming up, the children will make artistic gifts to honor the visit. And if it’s a child’s birthday, we invite the parents to participate in a Walk Around the Sun ceremony (the child makes one revolution around a symbolic sun for every year they’ve been on Earth). Encourage the self-motivation and self-discipline that lead to a life-long pursuit of knowledge. Lead the child to mastery of precisely identified intellectual, social and physical skills. Encourage mindful focusing to attain positive solutions. Instill a sense of belonging and foster a peaceful community. Develop open minds and hearts, as well as compassion and respect for others that will allow the child to become a productive member of society. Instill in each child a sense of duty and personal responsibility for the world in which we live . Balance self-reliance and independence with the skills of cooperation. Spark in our children imagination, wonder, humor and joy.